Spring is already here, and the rush to get fit before beach season starts has begun. Getting to the gym more often certainly is going to help you meet your weight loss goals, but your diet is ultimately what will make or break you. Before your next run to the supermarket, make sure to check out our list of the healthiest foods you can eat this season. These seasonal foods aren’t just packed with more nutrition than others which come from across the globe, but will also help you meet your weight loss goals as fast as you possibly can. Many of us eat peas all year long, as they tend to be food staple in many people’s diets. Peas actually come into season in the spring though, which means that you can pick up some fresh ones which are going to be more nutrient rich than the ones that have been sitting on a shelf for months. Peas are an excellent well-rounded food that is rich in protein, fiber, vitamin A, vitamin B6, vitamin C, vitamin K and a variety of other micronutrients our body needs. Strawberries are a food that many of us associate with summer, however they hit their peak in late April. Strawberries are an excellent snack and fat burning food as they satisfy our sweet tooth while still being healthy. 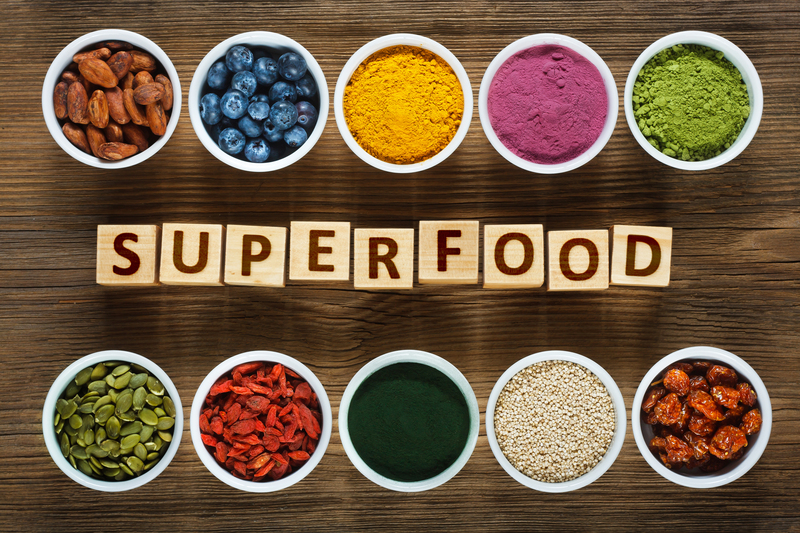 Along with that natural sugar comes plenty of fiber and other nutrients which can provide us with a good energy boost without a major crash like we would get from drinking a soda, eating candy, or having another type of sugary snack. Shrimp season begins in most places at the end of April, making this another spring favorite. Not only are shrimp really tasty, they can be extremely healthy as well. 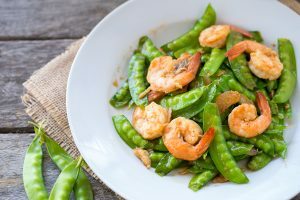 Your average 3 oz portion of shrimp is less than 100 calories while containing close to 17 grams of protein, making it a low-calorie food that can really help fight hunger. The only downside to eating shrimp is that they do contain a decent amount of cholesterol, however the high protein content, omega 3 fatty acids, and trace minerals like selenium far outweigh the negatives. Greek yogurt itself isn’t necessarily a seasonal food, but given that it is routinely paired with fruit, it is definitely a spring favorite. 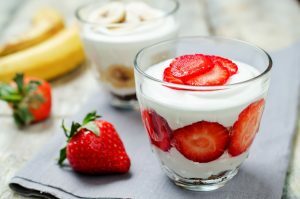 Greek yogurt is an excellent food in that it contains over 20g of protein per cup, along plenty of potassium, calcium, B vitamins and probiotics. Fresh fruit along with Greek yogurt is a great pairing, as the fruit adds some flavor along with powerful antioxidants. Adding Greek yogurt to your diet is a great way to help with weight loss, especially the stubborn fat around the midsection. Potatoes with white flesh are generally considered to be less nutritious than their sweet potato counterparts, which simply is false. Your typical baked potato is loaded with nutrition as well, including vitamin B6, vitamin C, potassium, and plenty of fiber. This food is believed to be the reason why the Irish on average historically were taller than their English counterparts – the Irish food staple was the potato while the English was wheat. Start using potatoes in place of wheat products to really benefit your body. Many of us beef up over the winter, which believe it or not has a lot to do with fluid imbalance. Winter is the season where we typically lean on comfort foods and foods which tend to have more preservatives. Fresh food is harder to come by in the winter, so we tend to eat more of these foods high in preservatives, mainly in the form of salts. The more salt we consume, the more water the body retains in order to maintain the proper balance of fluids within the body. This means that a lot of the weight we put on during the winter tends to be water weight, weight which can be removed through the use of hibiscus tea. This is because hibiscus tea contains compounds which influence the hormone which regulates our sodium balance, known as aldosterone. This helps to reduce bloating and to remove some of that water weight we’ve been carrying around. This food is one which many of us hardly ever eat if at all, a food which is common around the holidays. While artichokes do temporarily come into season around October and November, its peak season is in between March and May. The reason why this food is so great when it comes to weight loss is because of its fiber content. Just a 1/2 cup of artichokes contains about 7 grams of fiber, which is going to be about 20% of what you need for the day. Artichokes are one of the best foods you can eat when it comes to fiber, so make sure to pick some up this spring! Lettuce is always a great choice to help lose weight as the food tend to be nutritionally dense without being too high in calories. Red leaf lettuce in particular is extremely rich in vitamins A and K while being virtually calorie free. This food is one that you can pretty much eat as much as you want without having to worry about putting on any additional weight while doing so. Red leaf lettuce is an excellent weight loss food you need to be eating this spring. Cauliflower is a food you need to try this spring because it is a great low-calorie substitute for a variety of your cooking needs. Cauliflower brings that crunchy texture we all love without making us feel guilty afterwards. This food is an excellent source of fiber, vitamin C, and potassium; all of which will help slim you down quick. Spinach is a food we should be eating all year round, but we can find it the freshest in spring. Spinach is a food that is high in fiber, protein, as well as vitamins A, C, and K. This food is one of the best at suppressing our appetite, keeping us fuller longer which definitely helps in the weight loss department.